The 2017 PCANZ Summer School took place in Auckland again this year at St Cuthberts College in January. The format was different from past years in that this time multiple workshops were run giving participants the opportunity to do a couple of different workshops over the course of the week. It also meant that more people could take part. The programme for this year's week included six two-day workshops, studio visits and artist talks. The tutors were Jacqueline Aust (solar plate), Lynn Taylor (mixed media print), Kathy Boyle (plaster prints), Prue MacDougall (solar plate), Marci Tackett (polyester plate lithography), Terri Reddish (artist portfolio). I took part in Lynn Taylor's mixed media workshop which included techniques using relief solar plate, encaustic wax and collage using found and printed papers and materials onto laser cut shapes. As anyone, who has been a participant in one of Lynn's classes, knows she is a fun and generous tutor sharing her expansive knowledge and many inspirations. attaching papers to the laser cut shapes. On day one we began by choosing our shapes and then printing and sourcing papers and textures to apply backgrounds and patterns to our shapes. 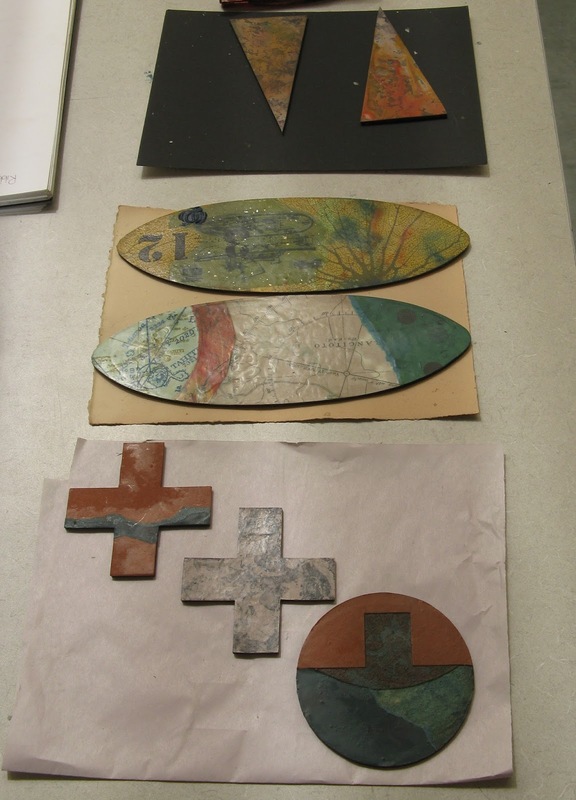 We also worked one-on-one with Lynn to learn the process of creating a relief solar plate to use in our work. Lynn must have run close to a half-marathon in the first day alone running up and down the stairs with each person to expose the plates outside in the sunlight! Amazing energy!! Toni Hartill relief solar plate created for Lynn Taylor workshop. Day Two began with a demo of using encaustic wax to add layers and effects to our shapes. Lynn Taylor demonstrates encaustic wax techniques. With 12 students in the workshop the room was a hive of activity and everyone created unique pieces using a full range of techniques and materials. Toni Hartill encaustic works in progress. Having learnt some new skills and been inspired with new ideas and, as is oft the way with how I work, I took a bit of a detour from the main direction of the workshop and went off on a bit of a tangent, still using the shapes and layers of printed papers but diving off into a more sculptural approach. With one approach, using the subject of the sea washing across pebbles I played with layering the printed surfaces at different heights, using different tones through printing on sheer fabric vs paper and playing with a horizontal structure vs a vertical structure. Toni Hartill work in progress. The other piece I played with was inspired by my interest in the islands along our coasts. Using the same printed papers and surfaces, I used the structure of a painted rod of wood to form a horizon line and the shapes in the form of hemispheres. This wee diversion was fed from some inspiration I have had percolating away for some time and so it will hopefully lead into a series of new works along this line. This is, for me, one of the best things about participating in new learning opportunities. You never know what you will come up with next (or at least, I never know what I will come up with next.) I love the way the brain works and how it throws out left-field ideas at the least expected moment! Note to self: work on this idea to take it further! A great blog post Toni, love your results, and the way you used the process to create extra dimensionality. Have shared this post to my blog.